The restoration of the Cathedral of Santa María of Vitoria-Gasteiz has merited the highest award given by the European Union for the conservation and enhancement of the city’s Cultural Heritage. The Europa Nostra 2002 Prize is the most important award ever given to a Spanish city. The Cathedral refurbishment programme has been conceived as a living project open to the public. 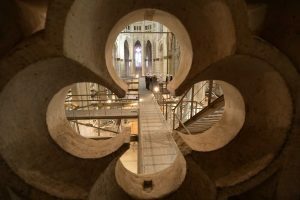 Visitors can enter the cathedral while work is in progress, discover its history and the solutions that have been proposed to resolve its architectural problems.